Both Spaghetti and noodles are very popular and favourite dishes of many. Spaghetti is one of the well-liked foods among Americans, although it has Italian origin. Some say that Spaghetti was originated in Chinese and traders may have brought in it to west. But Noodles were definitely originated in China, and recently world oldest noodle was excavated from there. Although both spaghetti and noodles are long and cylindrical in shape, noodles are thinner than spaghetti. Traditionally noodles are eaten with chopstick, whereas fork is used to eat spaghetti. The main ingredient of spaghetti is wheat flour, but noodles can contain different types of ingredients such as rice starch, rice flour, potato starch and Canna starch. High quality spaghetti is prepared of durum wheat. Generally Spaghetti boiled in water with olive oil or salt, and then they are served with sauce and additional toppings such as herbs (most commonly oregano), oil, basil leaves, meat, and vegetables. Pecorino Romano, Parmesan, and Asiago cheeses are most frequently used in spaghetti dishes to enhance the taste. Noodles are usually boiled in water or broth until they soften and then served with sauce and other dishes such as meat, seafood or vegetables. Some people add noodles as one of the ingredients to create other dishes like noodle salad, or fried noodles. Noodle salads are made with Thai glass noodle, whereas fried noodles are prepared by adding meat or vegetable with fried noodle. Chow mien, Hokkien mee and lo mein are example of fried noodle dishes. Noodles are also served with different type of soups such as beef or chicken soups. There are many popular varieties of spaghettis available in market. Spaghettini is a thin type of spaghetti, also known as angel hair spaghetti. It usually takes only 2 minutes to cook, whereas spaghettoni is wide in diameter takes much time to cook. There are varieties of noodles found in market such as ChÅ«ka men (Japanese), Lamian (Chinese) , mee pok (Southeast Asia), Nokedli (Hungarian) and Somen (Japanese). Shirataki is thin and translucent noodle made of konjac plant. 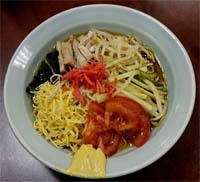 It is a type of Japanese noodle with low in calorie and carbs. It may be useful to people who are looking for low calorie and low carbs diet. 1. Spaghettis – Italian origin, long and cylindrical in shape, thicker than noodles, made of wheat flour and water, and eaten with forks. 2. Noodles- Originated in China, thin, long and cylindrical in shape, made of different ingredients, traditionally eaten with chopsticks. lancetana. "Difference Between Noodles and Spaghetti." DifferenceBetween.net. June 14, 2011 < http://www.differencebetween.net/object/comparisons-of-food-items/difference-between-noodles-and-spaghetti/ >. NEVER put olive oil in the water to cook pasta. Some people say it prevents the pasta sticking together in the pan. By doing this, it coats the pasta in oil and prevents it from absorbing the sauces, thus it doesn’t taste as good. To prevent pasta from sticking together in the pan, bring the water to the boil, then add the pasta (not the water to the pasta) and swish the pasta round with a wooden spoon for a few seconds. The correct way is to add salt to the pasta water. This article is less about the differences of the ingredients themselves and more about the difference in serving them. Quite honestly I’m disappointed – everyone knows how spaghetti is served – and if they’re here looking at this comparison they also know how noodles are served. Thus this article is completely off the mark and it wouldn’t be far from the truth to say – useless. I agree woth your comment. I ended not knowing the difference between both. I agree. This article didn’t answer the question.